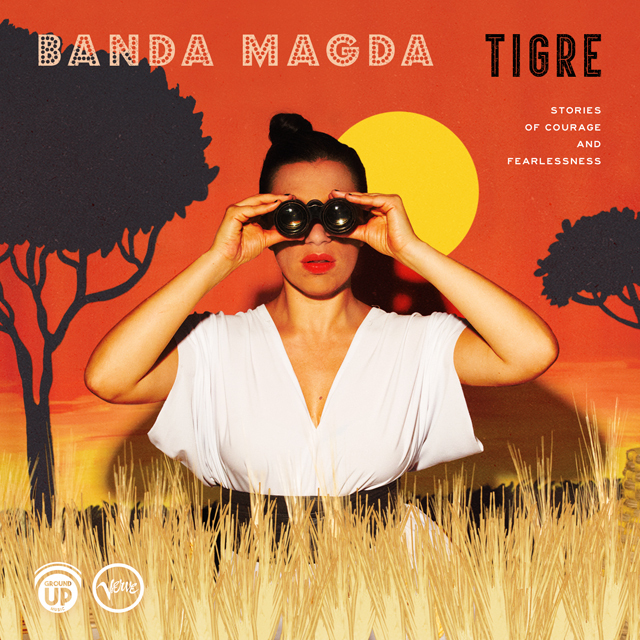 Tigre is the third full length album from Banda Magda. Miss Giannikou, who has created practically all of the music on the record on her own, has subtitled the album Stories of Courage and Fearlessness. They became meditations on a tiger’s mask that ostensibly hangs upon a wall where she lives. True to form, however, Miss Giannikou has created a living, breathing character from this contemplation, melding into it, one might assume, experiences and emotions that have and continue to touch her own life. What emerges is the story of a girl, growing into womanhood, learning to cope with disappointment and pain, and ultimately triumphing against all odds to become a woman of substance. The beauty of this entire coming-of-age story is that in all of the thirteen loosely-connected narratives very little is stated – at least in prosaic terms – but everything is evoked most lyrically and memorably. The Banda Magda sound is shaped by Miss Giannikou’s voice. It is marked by crystalline enunciation; it is light and high-sprung and Miss Giannikou uses this quality to draw listeners into her story, feel her every nuanced emotion to such an extent that one might easily find oneself laughing and crying with her as she peels away at the layers of meaning in the narratives and lyrics of the music. This is articulated through an almost Bizet-like evocation of Spanish locale in “Muchacha (Ojos De Papel). This just after a glorious fado has been conjured in “Coração”, which in turn followed a magnetic chanson “Tam Tam”. And on… and on it goes as we are willingly kidnapped into the world of Tigre and Banda Magda, which it must be mentioned (again) is nothing if not a group sound. The core ensemble of Mika Mimura on vibraphone, Marcelo Woloski on percussion and Ignacio Hernández has been joined by a stellar cast of musicians including the bassist and creator of Snarky Puppy, Michael League and the great Leni Stern on n’goni. For Tigre Banda Magda has also drawn on the skills of another major talent – violinist Curtis Stewart – around whom are eight other strings players who have come together to add a luscious viscosity to this music. Tigre is what one might refer to as a ‘great record’ because it has all of the musical elements – composition genius, arrangements and executional virtuosity in a heady mix that meets invisible elements such as surprise – in a perfect product. Track list – 1: Tam Tam; 2: Coração; 3: Ase Me Na Bo: Overture; 4: Ase Me Na Bo; 5: Muchacha (Ojos De Papel); 6: Vem Morena; 7: Chanson Lev; 8: Reine de Bois; 9: Le Tigre Malin: Narration; 10: Le Tigre Malin; 11: Le Tigre Malin: Reprise; 12: Venin; 13: Thiamandi. Personnel – Magda Giannikou: accordion, voice and piano; Jordan Perlson: drum set; Engin Gunaydin: drum set; Marcelo Woloski: percussion and vocals; James Shipp: percussion and vocals; Andres Rotmistrovsky: electric bass and vocals; Ignacio Hernández: electric and nylon string guitars; Bob Lanzetti: electric guitar; Justin Stanton: Fender Rhodes, trumpet and vocals; Mike Maher: trumpet, flugelhorn and vocals; Chris Bullock: tenor saxophone, flute, alto flute, clarinet and bass clarinet; Michael League: hammertone, baritone guitar and bass; Mika Mimura: vibraphone and marimba; Maeve Gilchrist: lever harp; Max ZT: hammered dulcimer; Ricardo Vogt: guitar; Or Bareket: contrabass; Ayumi Ueda: vocals; Giorgia Renosto: vocals; Annette Phillip: vocals; Debo Ray: vocals; Leni Stern: n’goni; Juan Andres Ospina: vocals. Featuring the Banda Magda String Orchestra – Primi: Maria Im and Curtis Stewart, Secondi: Brooke Quiggins Saulnier and Sami Merdinian; Viole: Lev Ljova Zhurbin and Irena Momchilova; Celli: Maria Jeffers, Sam Quiggins and Colin Stokes.